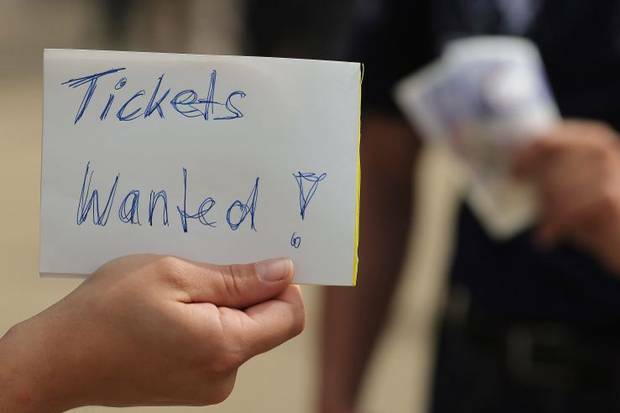 Well it’s been in the news once again and it looks like the government are being pressed to come up with some kind of solution to touts selling tickets at silly prices. Now let’s get this clear from the start, I don’t condone the tactics of those who use computer software to buy up tickets when they go on sale. I never have, and never will, pay more than the face value for a ticket. In fact there are some gigs that I refuse to go to because even the face value is extortionate. Let’s face it, there is no set price for a gig ticket, never has been and never will be. We all have our own limits of what we will pay, and because of this I’m dead against the government passing any laws on this matter. It’s common sense that if someone wants to rip you off and you know you’re being ripped off, then you say, ‘no, I’m not going to let you rip me off‘. If we need to look to our MPs for help with common sense then we really are in dire straits (not the band). We, the people, the fans, should be using the power we already have by not buying from a tout at silly prices. If a tout is selling a £10 ticket at £100 and that ticket needs to be sold by a certain date, they will have to reduce the price nearer the date so as not to lose any money. If we simply refuse to buy from them then they quite simply go out of business. If a shop is stocking a product and it doesn’t sell, they will stop selling it. So, who’s to blame? Well to be honest, those people/fans paying over the odds are just as much to blame for this situation as the touts. The more people buy from them, the more effort they will go to to buy the tickets and sell them on. Those buying at silly prices need to ask themselves the question, is it so important to attend the show that I’m willing to be ripped off? If the answer is no, then don’t buy the ticket. There’s no point buying a £10 ticket at a £100 and then complaining about it afterwards, you had the power not to buy it in the first place. But doesn’t that mean gigs will be half empty because the touts have loads of tickets? No it doesn’t. Those touts will have to get rid of their stock and they are not just going to throw the tickets away and lose all their money, they will resort to selling at last minute for face value or less if they have to, but as is stands, they don’t have to. The whole situation can be fixed by us, not by making new laws. We can put these people out of business over night if we really want to without going to the government for help. UPDATE 16/12/2015: If you’re a genuine fan and have bought a ticket you can no longer use you can’t get a refund, so why don’t these artists complaining about secondary ticketing make it so refunds are allowed. This way any spare tickets from genuine fans will go back on sale at face value through the primary ticketing companies. Can you get a refund for your Coldplay, Elton John or Mumford and Sons tickets. I doubt it, but still they are complaining about secondary ticket sites. How else are their fans who can’t attend shows going to get rid of their tickets. We have buying power and they have the power to allow refunds, put these both together and touts will suffer.